The butter cow is an Ohio State Fair tradition that dates back to the early 1900s. Today, more than half a million fairgoers enjoy the display in the Dairy Products Building each year. Shown is a part of the 2017 fair exhibit. COLUMBUS – In the heat of the summer, one of Ohio’s coolest traditions is taking shape. More than a ton of butter has arrived at the Ohio state fairgrounds, and sculptors have begun molding it into the long-standing favorites, the traditional cow and calf, as well as sculptures related to this year’s butter display theme, one of the best-kept secrets leading up to the Ohio State Fair (July 25-Aug. 5). The sculptors start by building wooden and steel frames to support the weight of the butter. From 55-pound blocks, sculptors slice the butter into manageable loaves and layer it to cover the frames. After many hours of molding and smoothing the butter in a 46-degree cooler, each sculpture begins to take shape. Fine details are added last. Each year, the American Dairy Association Mideast selects an icon or theme to feature in butter that is non-political, non-controversial and reflects optimism and broad audience-appeal. The 2017 display celebrated Ohio’s high school athletes and the official drink that fuels them, chocolate milk. Butter sculptures included a larger than life bottle of chocolate milk, tinted brown with cocoa powder, along with four high school athletes playing football, tennis, softball and soccer. The butter display at the Ohio State Fair attracts more than 500,000 visitors each year, reflecting positive ideals and cultural trends in Ohio for over 45 years. Several of its exhibits gain national media attention with themes that have universal appeal. The display is located in the Dairy Products Building at the Ohio Expo Center, home of the Ohio State Fair. The outside of the building will feature a brand new mural that celebrates Ohio’s dairy farmers and their proud contributions to communities across the state. The Dairy Products Building is open daily from 9 a.m. to 9 p.m. and offers a variety of Ohio-produced dairy foods including ice cream, milkshakes, cheese sandwiches and milk. In addition to enjoying the butter display, fair visitors can learn about how Ohio’s dairy farmers care for their cows, their land and their communities. 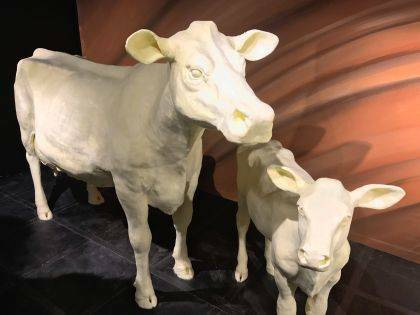 The butter sculpture display and the Dairy Products Building are sponsored by the American Dairy Association Mideast, Ohio’s dairy-farmer funded marketing and promotion program serving more than 2,200 of the state’s dairy farms. For more information, visit www.drink-milk.com. Submitted on behalf of the American Dairy Association Mideast.